On each episode of the NJTV series Pasta & Politics, host Nick Acocella invites a New Jersey political giant into the kitchen to talk politics and cook a meal together. 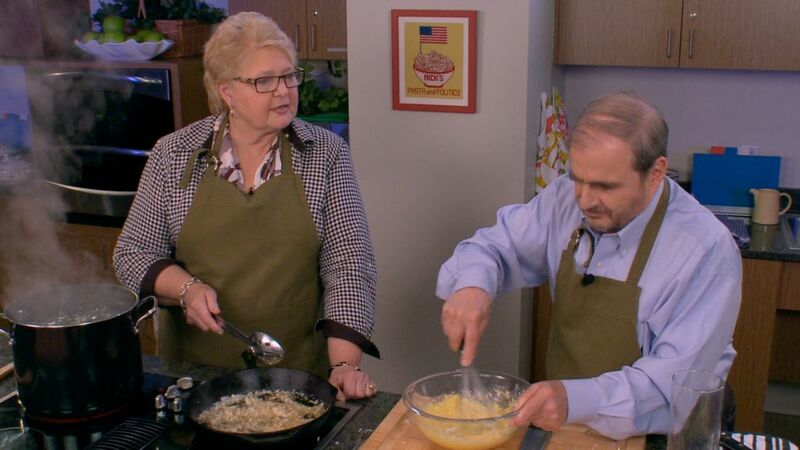 Senator Diane Allen and Acocella prepare Allen’s personal Linguini Carbonara recipe on the December 21 program. Here’s the make-it-yourself takeaway! Whisk the eggs, egg yolks, Parmesan, and salt and pepper in a serving bowl. Cook the pancetta in a skillet until it is crisp, then remove from skillet. Sautee the onion and garlic in the pancetta grease until translucent. Put the pancetta back in with the onions and garlic. Cook the linguini until al dente (firm, not soft). Reserve a cup of the pasta water to use if the sauce is too thick. As soon as you drain the finished linguini, pour it over the egg and cheese mixture and toss vigorously so that the heat of the pasta cooks the eggs. Put the pancetta-onion-garlic mixture over the linguini. Sprinkle the parsley over the dish.